Almost everyone who knows me, knows that I am an absolute freak for spares. 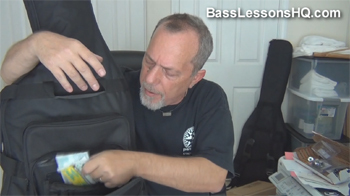 I believe it’s essential for the performing bassist to have everything necessary to take care of minor problems that may arise during a performance. To me, having spare strings and such are just part of playing bass. And I really don’t understand why some people never seem to figure that out. Here’s a short video in which I show you all the little things that go into those big pockets on the front of my gig bag. As I said in the video, start with strings (and a string winder) and then add one or two things at a time, as you can fit them into your budget. Make sure you outfit each bass you have so that, no matter which one you take, you’ll always have your bare essentials with you.